TORONTO, Sept. 19, 2017 /CNW/ - Inventive minds collaborated to redesign the community space revealed today at a popular community cultural hub in Toronto, Artscape Youngplace. Sparked by the Ontario Tire Stewardship's (OTS) third Design Challenge, University of Toronto Landscape Design and Sheridan College Industrial Design students used the equivalent of 854 recycled tires to create the environmentally sustainable space and OTS's most ambitious design project to date. "The goal of the Design Challenge is to ignite innovation by creating an environmentally sustainable design for an urban space, while showcasing the aesthetics, functionality and high-performance of Ontario tire-derived products," said Andrew Horsman, Executive Director, Ontario Tire Stewardship. "With the help of inspired designers, like these students, and our recycling network, we can continue to rethink tires to drive the circular economy, creating new jobs in Ontario, and ultimately diverting millions of tires from landfills." 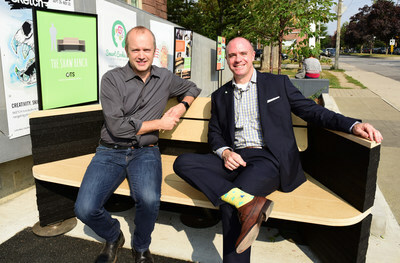 This was the first Design Challenge to incorporate an industrial design component, resulting in the creation of an innovative bench, by Sheridan College students, representing an entirely new use for recycled tires. Dubbed the "Shaw Bench" the creative product design includes an integrated bench and bike-rack and its modular design makes the bench highly adaptable, allowing for a variety of configurations. "We are delighted with the new community space at Artscape Youngplace, which translates the unique artistic spirit and cultural activity within our hub to the exterior," said Tim Jones, Artscape CEO. "We're grateful to Ontario Tire Stewardship for helping to transform our outdoor space through this innovative environmental program. All of the partners and the students who contributed their ideas and energy excelled to provide this community with an outstanding new place in which to engage, collaborate and be inspired by creative projects." In June 2016, 32 students from five different post-secondary schools across the province tested the boundaries of their craft, competing to either revitalize an urban landscape or create a product design that could be manufactured, both using recycled rubber tires. OTS Student Design Challenge teams attended a three-day intensive Design Jam, working alongside industry professionals to develop concepts and present to judges. Over a year later, the two winning teams can now share their work with the community. 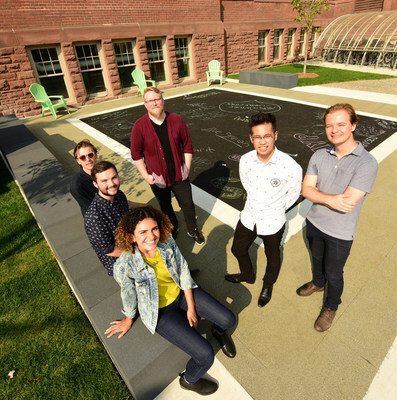 Design Challenge winners and space creators include: University of Toronto Landscape Design students, Andrey Chernykh, Leonard Flot and Tom Kwok and Sheridan College Industrial Design students, Alexandra D'Oliveira, Michael Mofina, Patrick Marchent and Neil Smith. Visit rethinktires.ca/designchallenge for more information about the Design Challenge. Established in 2009, Ontario Tire Stewardship (OTS) is an Industry Funding Organization (IFO) incorporated under Ontario's Waste Diversion Act, to implement and operate the Used Tires Program. At OTS, we are transforming the relationship Ontarians have with the lifecycle of their tires, through a comprehensive approach that takes into account our environment, our economy and our quality of life. Through the Used Tires program, Ontario tires get efficiently and responsibly recycled into new products, leading to more livable communities and a growing green economy in this province. Artscape Youngplace is a 75,000 square foot community cultural hub operated by Artscape in Toronto's West Queen West neighbourhood, devoted to artistic creation, learning, and collaboration. The facility opened in 2013 after a major renovation and community consultation process. Artscape's $17 million transformation of the building, a former school, was completed just before the centenary of its construction in 1914. Artscape Youngplace is named in recognition of a generous lead gift from The Michael Young Family Foundation. Artscape is a not-for-profit urban development organization that makes space for creativity and transforms communities. For more information please visit Artscape.ca.